Debbie Hill rode on the "A" hunter/jumper circuit as a child and junior. She became interested in dressage when she met Eugene Abello and Brian MacMahon in Miami, FL. After taking lessons and showing for about two years, Debbie took a working student position at their farm "Crescent Moon". "Eugene and Brian bred and trained a number of young horses, and needed a brave and adaptable young rider. I gained an invaluable education at their farm. They showed me a kind, systematic and classical way to train dressage horses. I was very fortunate to have been given the opportunity to ride several very different types of horses every day under their watchful eyes. I also was given the opportunity to ride, train and show young stallions." Debbie graduated from college and moved from Miami to Huntsville, AL for her husbands job in late 1996. She took a full-time accounting job at a local bank and began teaching and taking horses in training part-time in 1998. Debbie began teaching and training full time in 2001. "My business has grown year by year. I offer a training program to dedicated riders at any level. 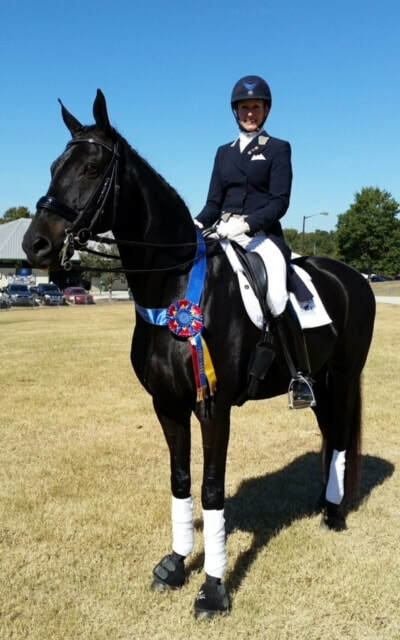 I really enjoy starting young horses for dressage." Debbie Hill has had the opportunity to work with many great dressage teachers over the years. A few of her favorites have been Karl Mikolka, Walter Zettl, Albrecht Heidemann, Volker Bromann and Juan Matute. Debbie currently trains with Roel Theunissen. an associate degree in accounting at the University of Mississippi. riding every day of her life.